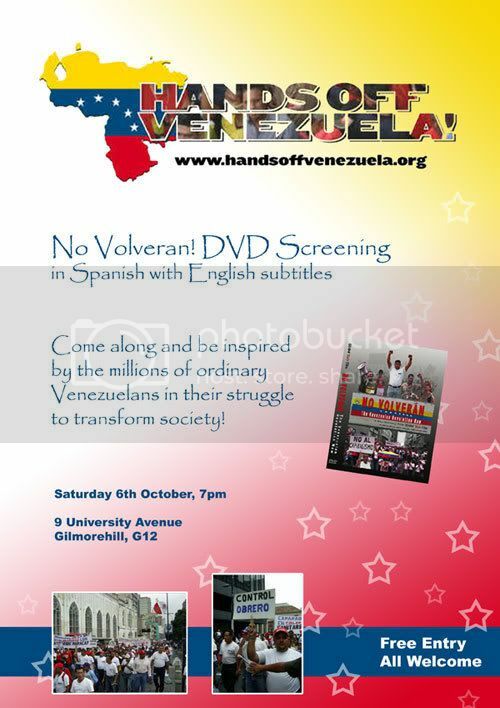 Hands Off Venezuela Glasgow is screening the documentary "No Volverán" this Saturday, October 6 at 7pm. Hands Off Venezuela Glasgow is screening the documentary "No Volverán" this Saturday, October 6 at 7pm. Venue - 9 University Avenue, Gilmorehill, G12. The film is an exciting feature length documentary about the Venezuelan Revolution. In this in-depth investigation the film makers take us on a journey through the fervor of the Presidential Elections in December 2006, traveling deep into the shanty towns (barrios), and to several factories under workers' control, to find out why there is a movement to over-through Capitalism, what Socialism of the 21st Century is, and how it is changing people's lives.